The effects of climate change combined with breakdowns in governance are leading to food insecurity “on a scale that we’ve rarely seen,” said Alex de Sherbinin, associate director of Columbia University’s Center for International Earth Science Information Network, at the Wilson Center on January 26. Last year government and non-government organizations committed the largest outlay of humanitarian assistance ever. Yet the unmet need was also the largest ever, said Richard Choularton, a senior associate at Tetra Tech. There is a “yawning gap” between need and capacity, said Dan Maxwell, acting director of the Feinstein International Center at Tufts University. Some humanitarian emergencies are a direct result of food insecurity, like famines, while others can quickly evolve into food crises, like violent conflicts. This year, it’s estimated nearly 70 million people globally will need emergency food assistance, said Maxwell, and a further 795 million people are chronically undernourished. 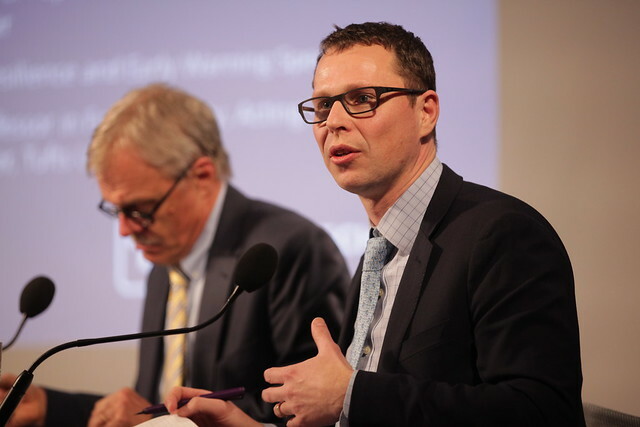 A panel of experts at the Wilson Center discussed how to prevent and mitigate food insecurity in the wake of humanitarian crises, and especially how to move from early warning to early action. There is no shortage of climate, agricultural, and economic indicators available to help us understand food vulnerability, said de Sherbinin. And there are tools that can turn that data into early warning systems and help policymakers create long-term strategies. Early warnings are crucial for two reasons. First, it is more cost effective to intervene early in a food crisis than later. Reacting quickly could result in spending only a fraction of what would be required after a famine has been declared, said Choularton. In a study from the UK Department for International Development, early response to a typical drought in Kenya (once every five years) was estimated to save $107 million, or 42 percent of the cost of a late response. The second reason is that early interventions can incorporate more development components than later efforts, which by necessity tend to be more focused on emergency humanitarian response. Development interventions help address underlying drivers of vulnerability, mitigating the possibility of future crises. And in some regions, like the Sahel and Horn of Africa, such cyclical food crises are a major problem. “We saw…in Somalia in 2011 this recurring phenomenon of early warning and late response, or knowing what’s coming down the pike at us, knowing that a crisis is happening, but not responding until really the opportunities for mitigating the damage to livelihoods, for preventing distress migration, and for preventing malnutrition and indeed death…had already slipped away,” he said. Drought caused production and labor market shocks across the Horn of Africa, which coincided with a global spike in food prices. Furthermore, the major epicenter of famine was controlled by the terror group Al Shabaab, whose policies undermined local resilience. Even with all of this information, the international community responded proportionally only once famine was declared, Maxwell said. Various efforts to prevent humanitarian aid from ending up in the hands of terrorists contributed to the slow response, as donors sought to avoid any chance that Al Shabaab would intercept assistance. One way of getting closer to that goal is building more local capacity and on-the-ground partnerships to put early warning data to better use and assure a timely declaration of famine, if necessary, said Maxwell. It is important to identify leverage points, said Mathys, to understand how to intervene, particularly when the vulnerability of individuals differs by age, gender, and livelihood. Once you have established intervention is needed somewhere, what is the best way to reach rural pastoralists, female farmers, the elderly, etc.? There is limited information on these leverage points, making it an important area of ongoing study. Mathys noted several innovations on the programmatic side to improve flexibility. USAID is using a “refine and implement” approach with Food for Peace awardees that gives them a year to do on-the-ground research to refine their program and theory for a more nuanced understanding of vulnerability patterns, she said. The agency has also introduced “crisis modifiers” that allow development programs to quickly receive an injection of funds to switch track and respond to a nearby emergency, in effect becoming humanitarian responders. Crisis modifiers help ensure there is rapid response to a shock, and development gains are not undermined. Other innovations include ongoing operations research by awardees, a greater emphasis on the diversification of livelihoods to reduce agricultural vulnerability, risk financing and microfinancing to improve access to capital, and a shift from focusing on food alone to general resilience to shocks and stressors, said Mathys. These adjustments provide hope that humanitarian responses will catch up with demand, but in many cases researchers and analysts are “innovating out of necessity,” said Choularton. Humanitarian needs have gone up fivefold in the last 10 years and are on track to increase again this year. What we need, said Choularton, is to disseminate the right information to communities so they can make better risk management decisions themselves, and most of all, to turn early warning into early action. Sources: European Parliament Research Service, Famine Early Warning Systems Network, Harvard University’s Program on Humanitarian Policy and Conflict Research, UK Department for International Development, United Nations Office for the Coordination of Humanitarian Affairs, U.S. Agency for International Development. 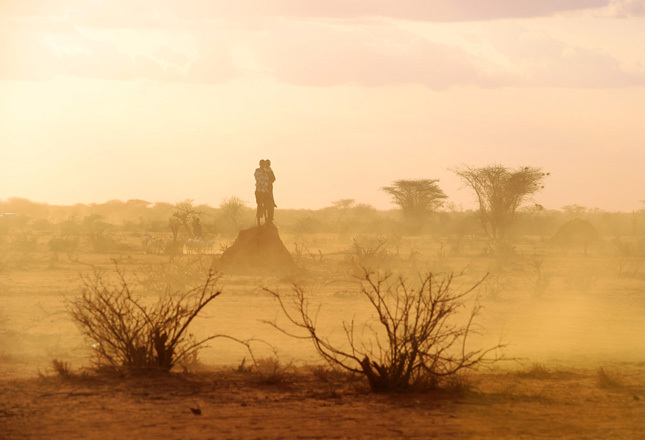 Photo Credit: Kenya during drought, September 2011, courtesy of IHH Humanitarian Relief Foundation.